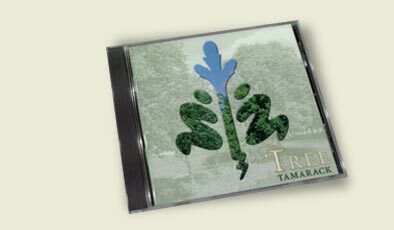 Tamarack newest CD is Tree. This CD was commissioned by the Tree Canada Foundation, whose mission is to protect and renew the forests within the urban areas of Canada, and to educate people about the value of their neighbourhood trees. Plant a Tree - an anthem about the beneficial aspects of trees and an exhortation to plant more of them. Firewood Song - A traditional folk song about a variety of woods and the pros and cons of using them as firewood. Made From Trees - In September, 2000, Tamarack went to Manitoba to perform in several schools as part of the Stand Tall programme, which is partnered with Tree Canada. While we were there we wrote this song about a large number of everyday objects that come from trees. The Ash Grove - Another traditional song with a sentimental, nostalgic bent, and a lovely string trio arranged by Shelley Coopersmith. Keep the Brown Side Down - Hey, that is the best way to plant a tree. Le Temps des Sucres - A French language version of our song about maple syrup. Recorded live with guitar, fiddle, mandolin, and clogging feet. Hold On, Caragana - Written by Don Freed of Saskatchewan, this song celebrates the Caragana bush that was introduced into western Canada to help hold down the soil during the dry Depression years. North Vancouver Island Song - Ian Tamblyn, from Québec, wrote this one to celebrate the regrowth of forests after logging on the west coast. City Trees - City trees have a tough time, what with scarce water, dirty air, and kids swinging in the branches. We need to appreciate how much they improve our quality of life, and do more to protect them. Hills of Evergreen - Sudbury used to be a barren place, where the trees had all been killed off by pollution from the smelting industry. In recent years, as pollution abated and people, including Tree Canada, planted millions of trees across the rocky hills, the landscape has softened under a regenerating forest. Maple Syrup - The English version of our song about how maple syrup gets produced. Gooderham Logging Camps - Tamarack facilitated a songwritn workshop at Gooderham Elementary School, and this is one of the songs written by the students there. It tells of the early days of their community when most of the men earned at least part of their living in the logging camps. The Trees Came Back - Written by Tree Canada advisor Dr. Peter Murphy of Alberta wrote this song detailing some of the many programmes run by Tree Canada to help augment the urban forest in communities across Canada. Tree was also produced by John Switzer. We were also assisted by a number of fine musicians, including Steve Briggs, John Adames, Randall Coryell, the students of Gooderham Elementary School, Kiki Misumi, Terry Tufts, Anne Lederman, and Steve Fruitman. Check out our order page. Spirit and Stone was released in 2000. The CD deals with people and their relationship to the land. This is a common enough theme in Canadian art - we have a big country with a few million people and the land looms large in reality as well as in our imaginations. For Tamarack, a band that has toured many times throughout Canada, as well as the US and Britain, the land and its people have always inspired our best work. Oh, Donald - During the Highland Clearances the British troops would occasionally let the Scots know that they were no longer welcome in their own land by using precious milk to extinguish the home fire, and then they would burn down the house. The Scots who were reviled by the English press as lazy, shiftless, and worthless became the proud backbone and sinew of early Canada and built many of our corporate and religious institutions - railroads, banks, churches. Retreating Like Tecumseh - a song about contemporary Canadian politics disguised in an arcane reference to a great native leader during the War of 1812. Tecumseh forged a grand alliance of First Nations to fight with the British against the Americans. In exchange, the British promised two things - that they would provide a permanent independent homeland for natives to protect them from the encroachment of white settlers, and that they would never retreat. Tecumseh died near Moraviantown Ontario keeping his promise even as the British retreated from theirs. The Old Wood Stove - Even modern day homesteaders face problems that early settlers would recognize - surly bankers, a bland diet, and recalcitrant wildlife. Steady On - A song inspired by our trip to Robin Hoods Bay in Yorkshire, England. The song has a country-blues tinge provided by Rick Fines' slide guitar; the lyrics include references to John Wesley, England's great hymnist, the funeral of Lal Waterson, one of England's greatest folk singers who dies just before we made it to her home town, and the title comes from one of our European agent's favourite sayings. 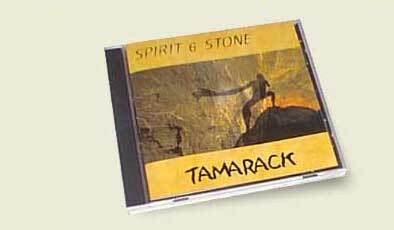 Water Run Over the Stone - a love song, if you can believe that Tamarack is capable of such a thing. Inspired partly by the Birks of Aberfeldy and mostly by the Nottawasaga River area of Ontario. The Gradual Demise of All Things - a song about entropy. Hi-Lo Reel - an instrumental written by Shelley Coopersmith. 1700 Years Ago - Mollys husband, Harri Palm, wrote this one for us. He's an avid outdoor kind of guy who likes imagining what our country looked like before all the people cluttered it up. Those Fatal Lights - written by ex-Tamaracker James Gordon about the problem of tall buildings and migrating birds. I Wish It Would Rain - an old Temptations song in honour (honor?) of Mollys early years in Motown. Campfire Light - An early song from the magic pen of Ian Tamblyn, one of Canada's great natural resources. This song conveys a delight in camping, canoeing, dancing, and singing. It's as good a theme song as Tamarack has ever had. Dans Le Nord Canadien - Zachary Richard is a Cajun from Louisiana who has spent a large part of his career in Quebec. This song expores some of the Cajun roots in Acadia - the eastern part of Canada from which the Acadians were exiled in 1755. Spirit and Stone was produced by John Switzer. John was a member of Jane Siberrys band for many years and co-produced several of her albums. He has worked with many Canadian artists such as the blackflies, Grievous Angels, The Waltons ... and brings a fine ear and great musical suggestions to our recording process. It was a real pleasure working with him and we think that this new CD is a big step forward for us, while remaining true to the sound that Tamarack has forged over the years. Check out our order page.